This calendar is made up exclusively with photos of Kloud 9 Boxers. The photos were submitted from our Kloud 9 Families. We feel this calendar is a memorable way to share and enjoy your photos with everyone. * Please specify your boxers birth date when submitting the photo so we can review it for the proper calendar. As well as placing your boxers birth date in the calendar. PLEASE remember that not all photos will be able to be used. * This is a Kloud 9 Boxers Calendar... 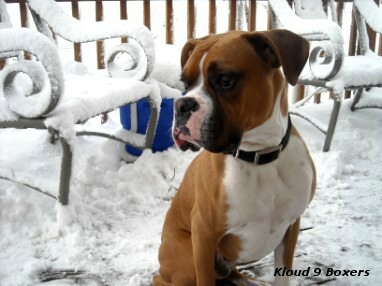 Please submit only pictures of your Kloud 9 Boxer(s). No humans please. * Pictures from phones may not work due to the sizing of the calendar so please try to only submit pictures taken from a camera. PRE-ORDER YOUR 2014 KLOUD 9 BOXERS CALENDAR NOW !!! To pre-order your 2014 Kloud 9 Boxers calendar, fill out the order form and then go to the paypal link on this page to make your payment. The Calendars are $27.00 each. They must be paid for one at a time.